Verde 1st appearances is on "Kamen Rider Ryuki" series. 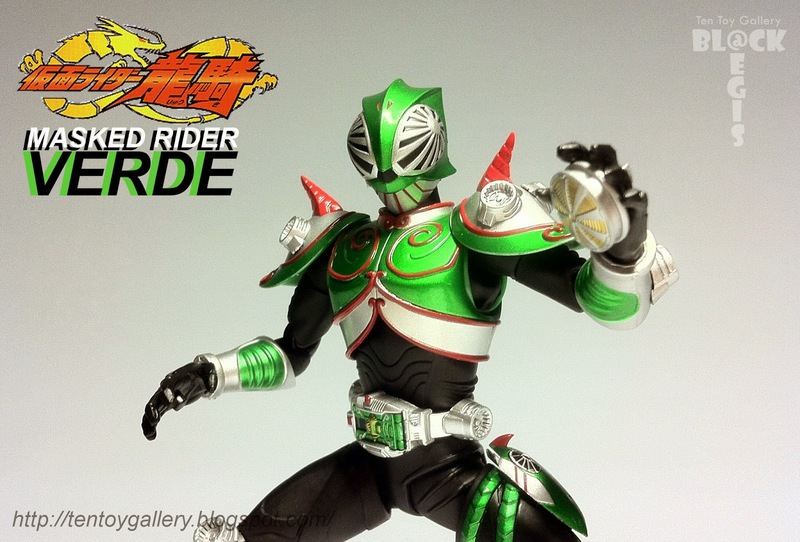 Kamen Rider Verde's forte in combat is deception. He has two cards which allow him to play illusions on his targets, deceiving them before attacking them. In addition, he does not rely on face - to - face combat, preferring to strike where they are vulnerable. However, Verde is physically weaker than the rest of the Riders because of this strategy. Verde's primary Weapon is the Bio-Winder, a type of whip which Verde uses to constrict his enemies. He primarily relies on his Clear Vent, which makes him invisible, and the Copy Vent, which allows him to assume the apperance and weapon of a Rider. His Final Vent is Death Punish, where Biogreeza wraps his extended tongue around Verde's legs and swings him towards his opponent where Verde grabs the opponent and slams his opponent head first into the ground (source). Den-O Axe Form 1st appearances is on Masked Rider Den-O series. Masked Rider Den-O Axe Form is the third combination form with the imagin from Maksed Rider Den-O. It's a combination between the blank Form and Kintaro Imagin (キンタロス). Using an Axe as a weapon. It comes with a gold color armor and am axe looks a like masked.